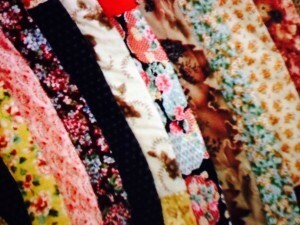 Some time ago my son gave me a few pieces of beautiful Japanese fabrics. These few pieces became the inspiration for a quilt I constructed for him. I used all these pieces as the basis for the colour palate choices. 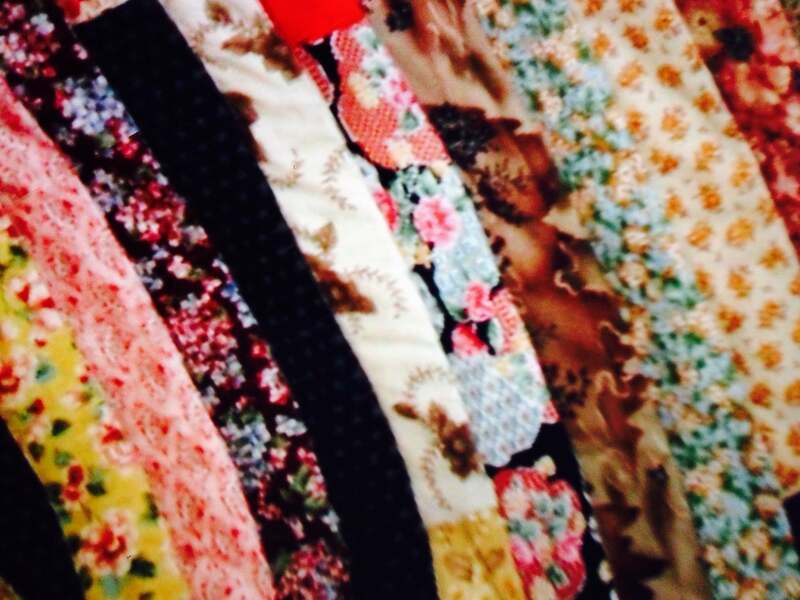 I then combined them with fabrics I already had in my stash which I think are complementary to the original pieces. The colour palate then was blues, browns golds and reds. I ensured a sufficient mix of fabrics to give plenty of interest. I decided to make a strip quilt, I cut all the fabrics into 2 1/2″ strips, then joined them all together making sure there was good distribution of the fabrics before commencing the piecing. 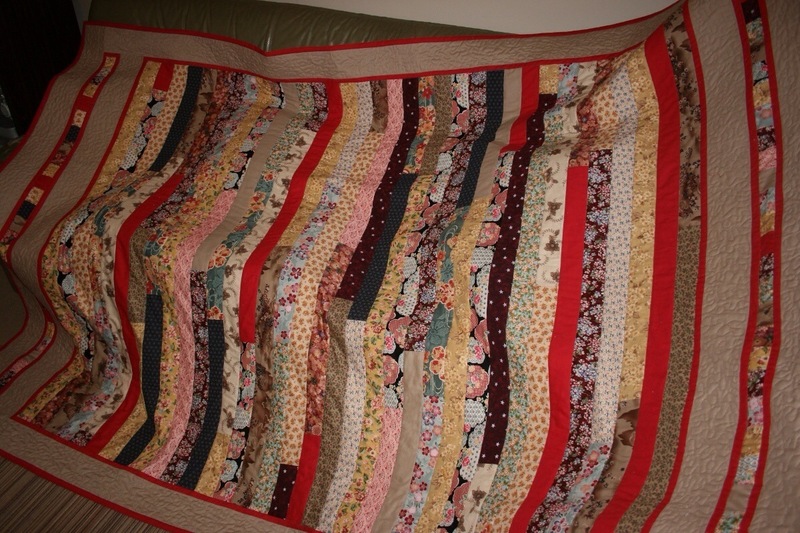 Once all the strips were sewn together I framed the quilt with narrow red borders, followed by bordering the quilt in a somber taupe solid colour, which makes all the other fabrics jump out from the quilt, giving them proper representation. 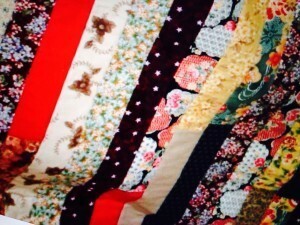 I used small pieces to make a “window” style border at the ends of the quilt. I quilted the strips in the ditch and then stipple quilted all of the taupe areas. I used the same red as the narrow borders for the binding which ties it all together. 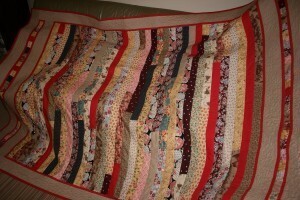 The lessons learned with making a strip quilt of this type is that the strips cannot be added continuously. 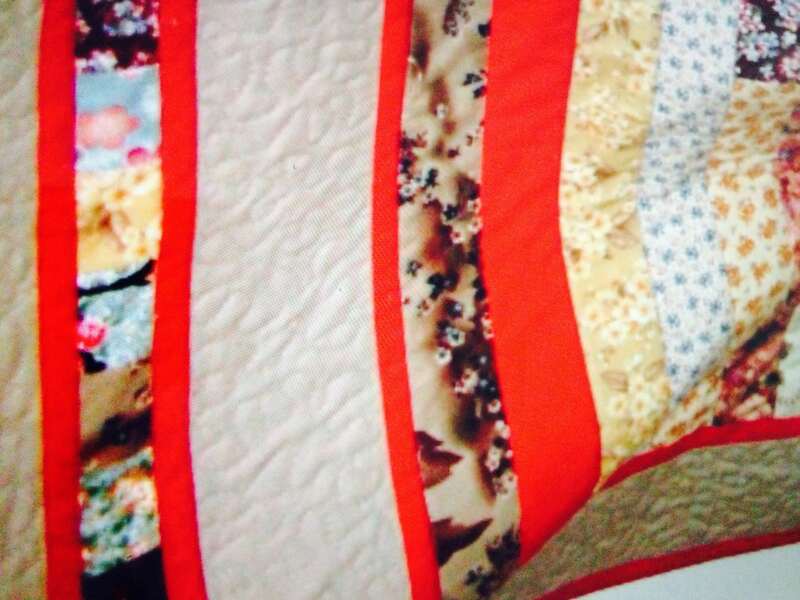 The width of the quilt should be decided, then sewing groups of five strips at a time and sewing from either side is the way to go, then joining the groups of five together. This will prevent bowing of the fabric and design. 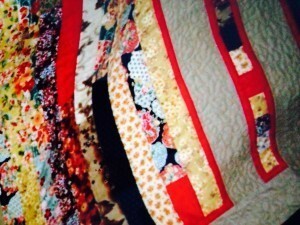 I have combined Japanese fabrics with complementary quilting prints and solids. 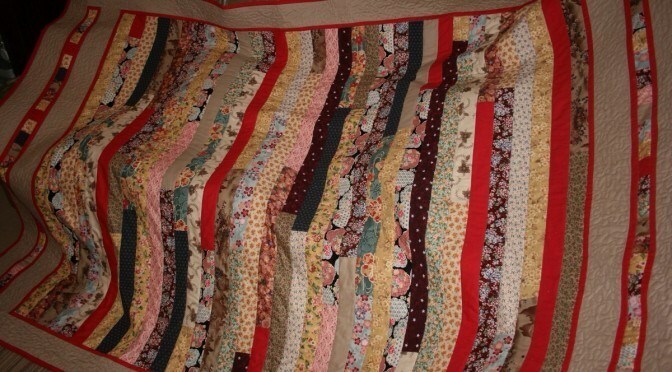 I believe the combination works well and although the design is simple it makes a striking quilt with lasting appeal. you are amazing! So many great ideas! 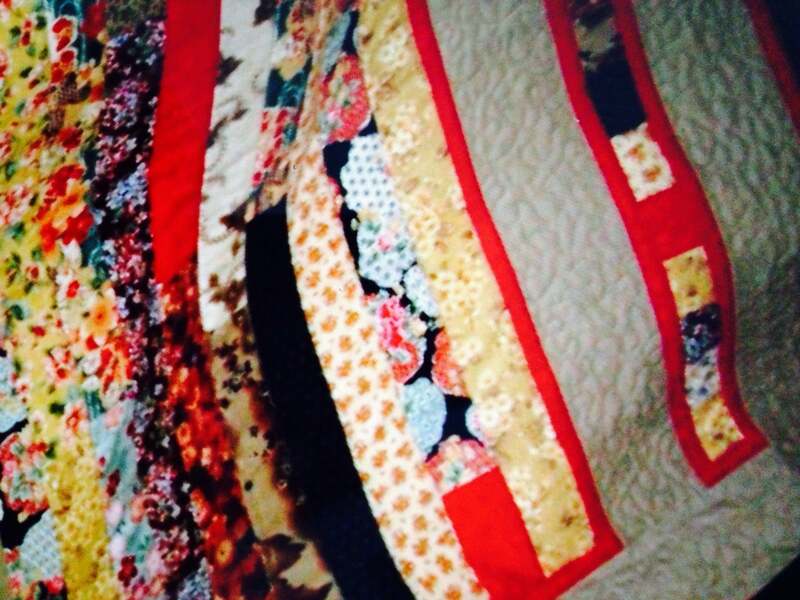 I made 2 of your quilts using my scraps. Dear Ceci, how wonderful! That warms my heart! Thank you for sharing!